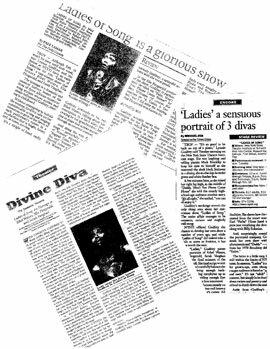 “Ladies Of Song” is an homage to three great Ladies: Ethel Waters, Ella Fitzgerald and Sarah Vaughn. The performance is a two act, 110 minute (with intermission) copliation written by Max Sparber containng songs, annedotes, stories and also tells how these three woman influenced Ms. Godfrey’s life. …”This is a shouldn’t -miss treat”…..
… “Ladies of Song Is A Glorious Show “…. …” Without tempting to imitate the women, Godfrey calls on her considerable acting and singing resources to give us the flavor of each performer’s career in a production that is bright, funny and at times, moving”….